Stopping an earthquake before it starts? It sounds like a feat possible only for a superhero. But in Kansas and Oklahoma state policymakers are showing that insofar as humans are causing earthquakes, they can stop them, too. After restricting oil and natural gas operations in certain hotspots, Oklahoma is feeling an average of about two earthquakes a day, down from about six last summer, and Kansas is feeling about a quarter of the tremors it once did. Using a growing body of research, along with trial and error, scientists and state regulators are gradually getting closer to pinpointing the cause of the startling increase in earthquakes in the Central and Eastern U.S., and preventing them. The general cause, scientists have found, is not drilling, but what happens after, when operators dispose of wastewater that comes up naturally during the oil and gas extraction process. The operators inject the wastewater into disposal wells that go thousands of feet underground, which can increase fluid pressures and sometimes cause faults underneath or nearby to move. Since March 2015, Kansas and Oklahoma have placed new restrictions on how much wastewater each operator in certain areas can dispose of at a given time. To gather more data, Oklahoma, Pennsylvania and Texas are expanding their seismic monitoring systems this year, placing permanent stations across the states and moving temporary stations to new hotspots. And Oklahoma and Texas hired more staff or are contracting with scientists to study the geology of areas where earthquakes are occurring, the details of the quakes that happen, and the oil and gas activity that may be associated with them. About 7 million people across the Central and Eastern U.S. are now at risk of man-made shaking powerful enough to crack walls and rattle items off shelves, according to a one-year United States Geological Survey (USGS) forecast released in March. The report outlined the risk from man-made earthquakes for the first time, listing the states with the highest risk in order as Oklahoma, Kansas, Texas, Colorado, New Mexico and Arkansas. The tension below ground brought rise to political tension, too. Many of the epicenters are in rural towns in conservative states, which generally shy away from government regulations. The oil industry regulators in Oklahoma and Texas are elected officials, with campaigns often funded in part by contributions from the industry, said Cliff Frohlich, a seismologist with the University of Texas at Austin who has studied man-made quakes in Texas. In Oklahoma, Republican Gov. Mary Fallin was at first hesitant to connect wastewater disposal with the quakes. Now, she’s taking action. In January, she allotted $1.4 million in state emergency funds to the state’s regulators and scientists to increase the state’s monitoring and research. States in the Central U.S. really weren’t ready for earthquakes—they didn’t need to be. From 1973 to 2008, the region saw on average 24 earthquakes of magnitude 3 or larger each year, according to USGS. These are quakes that can cause minor damage or more. The USGS tallied 1,010 earthquakes in the region last year, a number that has increased steadily from 318 in 2009. Parts of the historically aseismic region, such as northern Oklahoma and southern Kansas, are now as seismically active as California. The spike corresponds with the drastic increase in oil and gas operators’ use of hydraulic fracturing, or fracking — a technique in which water, sand and chemicals are pumped at high pressures underground, fracturing rock and freeing trapped oil and gas. Fracking has allowed operators to drill in new places and get much more from each site. While fracking itself is rarely the cause of quakes, it is one reason why there is so much more wastewater to dispose of, Bidgoli said. Injection wells have been safely used for wastewater disposal for decades, with permission from the U.S. Environmental Protection Agency, which has directed operators to bury the water thousands of feet below ground to avoid surface contamination. But now, the agency is looking for other options. In Oklahoma, Fallin created a group in December to study how the wastewater could be recycled or reused. Meanwhile, scientists are trying to pin down answers: Is the wastewater being buried too deep, or is there too much being buried, or are large amounts being buried too quickly? The regions most likely to see earthquakes associated with wastewater disposal are areas where there is more water naturally in the ground, such as in south-central Kansas, where extracting one barrel of oil means having to dispose of at least 16 barrels of wastewater, Bidgoli said. States’ responses to the quakes have varied. But scientists and regulators say that’s mostly a good thing, as the geology of each area varies. Since 2008, Arkansas, Colorado, Ohio and Texas have placed new restrictions on the disposal of wastewater in injection wells, although those haven’t affected operations as broadly as the new rules in Kansas and Oklahoma. Kansas was studying the issue in 2014 when a magnitude 4.8 earthquake hit southwest of Wichita. That day, Republican Gov. Sam Brownback announced the expansion of the state’s seismic monitoring system. In March 2015, the Kansas Corporation Commission, which regulates the industry, began limiting wastewater disposal in five zones and two counties. Since then, the state has felt fewer tremors. In the last six months of 2015, there were 39 quakes of magnitude 2.8 or larger, compared to 48 quakes during the last six months of 2014. In the first six months of 2016, only 11 were recorded by USGS. This is probably a result of the new restrictions and the slowdown in oil and gas production, said Rex Buchanan, interim director of the Kansas Geological Survey. The number of oil and gas wells drilled in the state declined almost 64 percent in a year, to 2,080 wells in 2015. Oklahoma was slower to make sweeping changes, although it first began regulating the wells in 2013. In spring 2015, the state took its first broad approach, asking all operators to prove they weren’t drilling too deep. But when quakes continued to increase, they decided that volume cutbacks were needed. In March, the Oklahoma Corporation Commission began restricting how much wastewater operators dispose of in about 600 of its 3,800 disposal wells, in certain hotspots. Since the regulations began, Oklahoma operators have drilled a million barrels fewer each day, a decrease driven by both the new rules and low oil and gas prices, said Jeremy Boak, a geologist and director of the Oklahoma Geological Survey. Oklahoma felt 619 earthquakes of a magnitude of 2.8 or higher from January through June, compared to 701 during the same time last year, according to USGS data. While state regulators in Kansas and Oklahoma have acknowledged a connection between earthquakes and wastewater injection, the Texas Railroad Commission, which regulates the industry there, has not clearly done so. The state takes the issue seriously, said Ramona Nye, spokeswoman for the Texas commission. It put in place rules restricting use of disposal wells in areas of seismic activity, hired a seismologist, and gave staff the authority to set volumes and pressures on wells, and shut down a well if there is a correlation between it and a quake. And Texas Gov. Greg Abbott, a Republican, signed a bill last year to spend $4.5 million on studying the issue. About 26 percent of the earthquakes of magnitude 3 or higher in the state since 1925 were almost certainly induced, according to a new study by Frohlich at the University of Texas at Austin and others. The funding, which was approved by the governor, will go toward installing 22 permanent stations and buying 36 portable seismometers to monitor seismic activity across the state, along with research run by the University of Texas at Austin. Regulators in Kansas and Oklahoma say oil and gas companies resisted the new rules at first, but the companies are now cooperative, even helpful, in providing information about their land and operations. This is mostly because the companies are a part of the communities they work in, said Steve Everley, spokesman for Energy in Depth, an advocacy branch of the industry-backed Independent Petroleum Association of America. 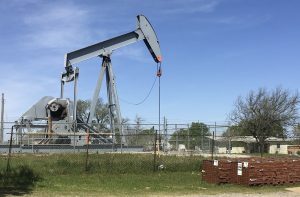 Despite the cooperation, Kim Hatfield, the president of Crawley Petroleum and a vice chairman of the Oklahoma Independent Petroleum Association, said policymakers should be cautious about imposing restrictions on the industry. The regulations in Oklahoma would have caused a major reduction in drilling and revenue if low energy prices hadn’t reduced drilling, Hatfield said. It’s important to understand what exactly is causing the quakes, he said, so when the price of oil recovers, the oil industry isn’t stuck with “ineffective or over burdensome regulations.” If the exact cause is determined, he said, there may be ways to safely use disposal wells. Scientists are worried about what will happen when production picks up again. If the business becomes more profitable, more people in larger areas may be at risk of quakes, Bidgoli said. Other concerns, such as building codes and earthquake insurance, haven’t been a big part of the conversation yet, except for in Oklahoma. Two bills were introduced there earlier this year — one that would prevent insurers from denying damage claims resulting from man-made quakes, the other to create a state-run insurance program. Both failed to pass. Boak said he isn’t envious of policymakers. While scientists can go back and forth for decades on what’s happening, he said, regulators have to make decisions about who to hold liable. “I’m very glad, as a geologist, I don’t have to have the answer for that,” he said.